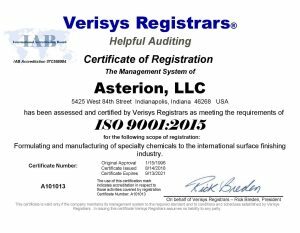 INDIANAPOLIS, September 19, 2018 – Asterion, LLC is pleased to announce that it has received certification to the ISO 9001:2015 Quality Management System (QMS). Verisys Registrars conducted the independent, third party certification and issued Certificate Number A101013. ISO 9001:2015 certification denotes that Asterion is compliant to the International Standards Organization (ISO) quality management system and has demonstrated its ability to consistently provide products and services focused on enhancing customer satisfaction. It is the only standard in the ISO 9000 family against which third-party certification can be carried. Blair Vandivier, President and CEO of Asterion said, “Earning ISO 9001:2015 certification demonstrates Asterion’s firm commitment and robust capabilities to provide best-in-class plating, pretreatment, and applications solutions to the surface finishing industry.” Asterion and formerly Benchmark Products has been continuously registered to ISO 9001 (various iterations) since 1986. Asterion products and services are backed by an advanced analytical laboratory which performs a range of chemical analysis that complies with industry standards and government regulations. Conducted by the company’s highly trained team of quality and technical services engineers, testing includes chemical composition and trace analysis to determine composition, impurities and overall chemical quality for a diversity of applications. The laboratory also houses instrumentation to quickly identify and resolve contamination issues, determine sample make-up and provide metal substrate testing and analysis.